I awoke at sea about 60 nautical miles northwest of San Diego. Greeting me on deck at 6 a.m. was dense fog and an ocean slick-calm. Courtesy of the National Oceanic and Atmospheric Administration, I’m aboard the U.S. government ship David Starr Jordan. 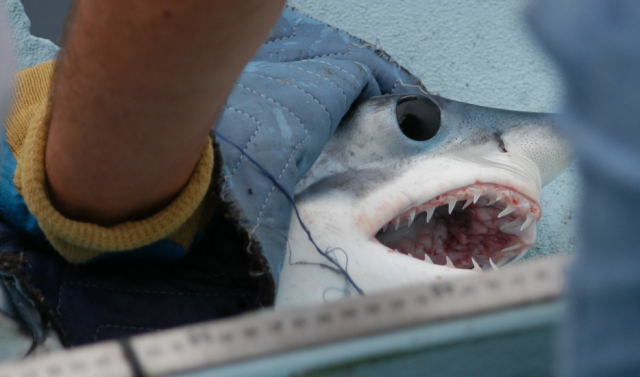 This cruise is part of a shark abundance survey that started in the mid-1990s. We’ll also be doing some oceanography, taking profiles of temperature, salinity and depth, and doing sonar transects to get some measure of plankton. Tax money well spent, for a change. 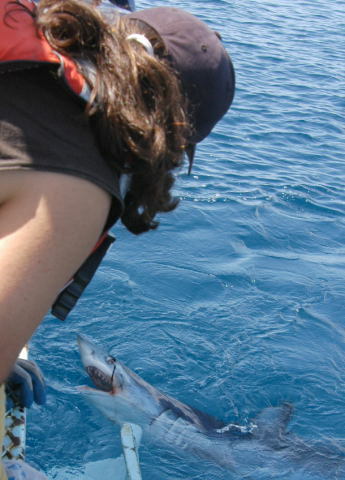 Mainly we expect to be catching, tagging, and releasing Blue and Mako sharks. I’ve caught these with rod-and-reel on my own boat, and I’ve seen some brutes. But this is a nursery area, so we’re expecting mainly baby sharks. We’ll try to see how many sharks are out there, says chief scientist Dr. Suzie Kohin. 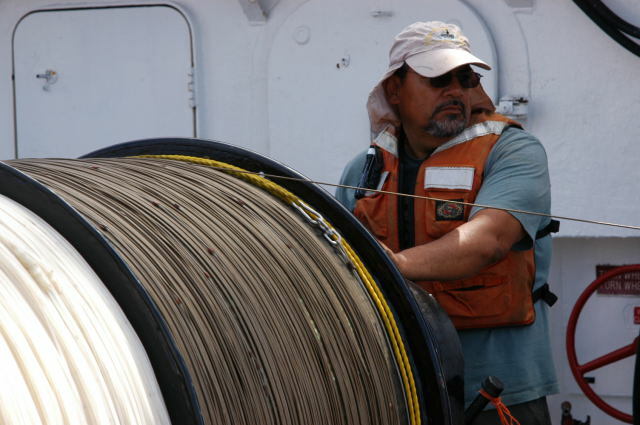 The fishing method is a “short” longline: two miles of cable with 200 hooks. (Commercial longliners often use 25 miles of line, sometimes twice that.) The hooks are J-shaped, steel, with 2-inch shanks and a 1-inch gap. We start making our first set just after 6 a.m. The cable is stored on a big drum about four feet in diameter. The end is run overboard through pulleys and tied to a big buoy with a flag. The boat moves slowly forward, pulling the line out. Hooks and leaders have to be attached as the line goes out. 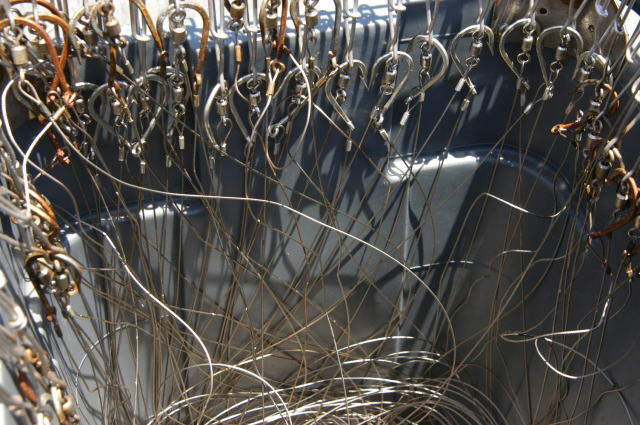 The hooks are kept racked along the rims of large plastic garbage pails, about 100 to a pail. The pails hold the leaders, about 12 feet long. At the end of each leader is a large stainless snap that grips the longline. Two people pick out hooks and hand them to two other people who bait them. The bait is dead mackerel, and the hook goes in the mouth, out the gills, and then into the body. The baited hooks get handed to the person designated as “clipper.” Every five hooks, a brightly colored buoy gets clipped on. My job is buoy boy, and to qualify you have to count to five. In practice this is much more difficult than it sounds. 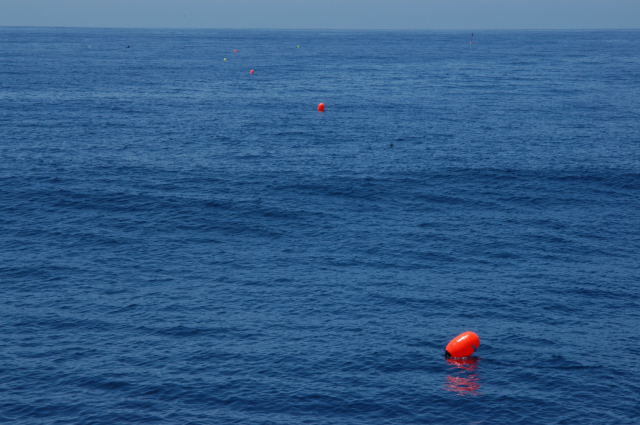 Suddenly the most important question in my life is, “Was that the fourth hook, or the fifth?” At any rate, our wake is soon marked by a line of bright, bobbing buoys, looking festive. Raining on the parade is a California Sea Lion diving among the baits. If he’s hungry, he’s relieving each hook of its bait. We can only look on helplessly, hoping he’s already had a hearty breakfast. Many commercial and recreational fishers hate these animals – and the Marine Mammal Protection Act. Setting takes nearly two hours. We let the line soak about three hours. Then, with the hazy outline of San Clemente Island just 4 miles west of us, we start hauling, starting with the last hook set, everything in reverse. Turns out the sea lion did not strip our baits. Baited hooks start coming back just as they went out. For over 20 minutes, it’s hook after hook. And then the sharks start. 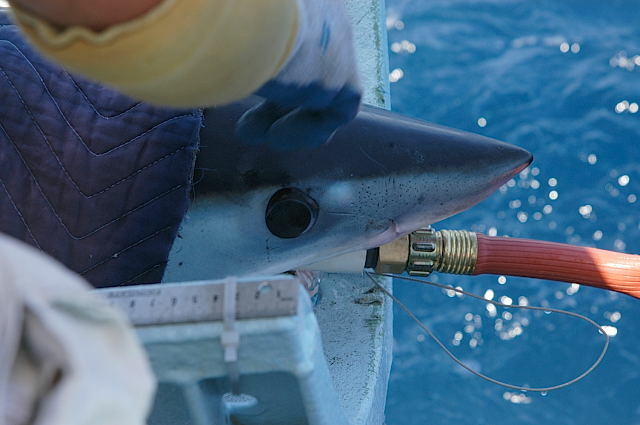 At 10:26, a small Blue Shark turns up on a hook. It’s less than three feet, one of the smallest blue-dogs I’ve ever seen. Its leader gets unclipped from the main line and it is led to the back of the ship and into a cradle. The cradle is raised out of the sea and the scientists, on their knees on a platform, get to work. Suzie and two assistants cover its eyes, and put a hard plastic hose-end into its mouth to keep it ventilated with water and oxygen. They insert a streaming numbered tag that is anchored into the skin with what looks like a small steel arrowhead. Into its dorsal fin goes another tag that looks like a cattle ear-tag. A snip of fin goes into a vial for DNA analysis, and some blood is drawn. 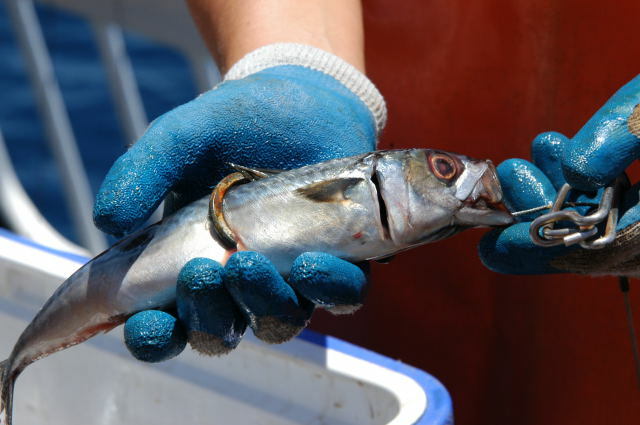 The shark then gets an injection of tetracycline, which will reveal its growth rate if it is eventually killed and returned by fishermen for the offered reward. Some of this bothers me, honestly, but I understand the value in it. Sharks certainly need better management. We need the information on which to base good management policies. This baby Blue is followed by two others and four Makos. Only one is male. One of the Makos is a husky five-and-a-half-footer, about 110 pounds, with a thick, sleek body. Because of its size, it gets a couple of high-tech tags, one to track it via satellite and another that can store information about its vertical travels. When it gets released, it bucks out of the cradle like a thoroughbred, and vanishes before the bubbles clear. No he doesn’t. He just needs a freedom and clean waters to live. There is no need to “manage” the nature; important is to respect it! Marvelous series and great photos. I’m linking to here from a pop-science article about makos. It’s more upbeat than the “eeek a shark!” sites.